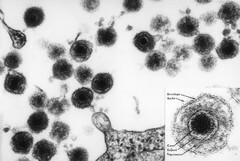 An electron micrograph of HHV-6 also includes a labeled insert of the mature virus particle. The HHV-6 is a double stranded DNA virus of the herpes family. The virus particles shown here have matured and are then released from the lymphocyte which has been infected. The "owl's eye" appearance of the virus particles is characteristic of the herpes family. The HHV-6, or the human herpes virus-6, was thought to infect b-cells and was at one time called HBLV, human b-lymphotropic virus. It is now known to infect t-cells and is the cause of the childhood rash "roseola" and some cases of mononucleosis.